polish insomniac: Top Ten Tuesdays - What's in my Beach Bag? The bag itself! I found mine this year in the seasonal section at Target. It looks just like this one from Target, except it has white stars! I love that it has a clear outside pocket, where I can keep little things that I need to find quickly - like my phone, sunscreen, etc! My beach towel! I love beach towels, I feel the need to buy a new one every year! I picked this one up from Target (see a pattern here?) and I love that it is super long. Cheap Sunglasses - I am the queen of losing expensive sunglasses, so you will never find me wearing a designer pair. I tend to buy them frequently, though, so I am sure I spend as much money in the long run! I pick them up at Ann Taylor LOFT. Super cute and super cheap sandals - I recently picked these ones up at Old Navy for $5! Reading Materials - I like to switch it up between trashy celeb mags, InStyle and more serious reading material. Currently that is an biography on Cleopatra. SPF - L'Oreal Sublime Sun SPF 50 for all over and Neutrogena Wet Skin in the spray can for when I get out of the pool. More SPF - Can't forget your lips! I am still loving Supergoop! AcaiFusion SPF 30 Lip Balm. This has replaced Jack Black as my favorite lip balm with SPF! Wet Brush - Have you tried The Wet Brush yet? Now that I have I can't live without it! It's amazing flexible bristles can tame my wet tangles without pulling out all my hair! I have the Wet Brush Squirt in pink - it's so cute! Carrots! We actually love to "sneak" snacks into the pool in my Thirty-One mini cooler. You know everybody does it! Plus the only thing they have at the snack bar are fried foods. Coola Radical Recovery After-Sun Lotion -I like to this bring it with me in in my mini cooler. Imperative to have on hand when you realized you've stayed out in the sun too long - or worse, missed a spot when applying sunscreen! It contains all kinds of good for you ingredients like Agave, Aloe, Lavender Oil, Rosemary Extract and Sunflower oil. 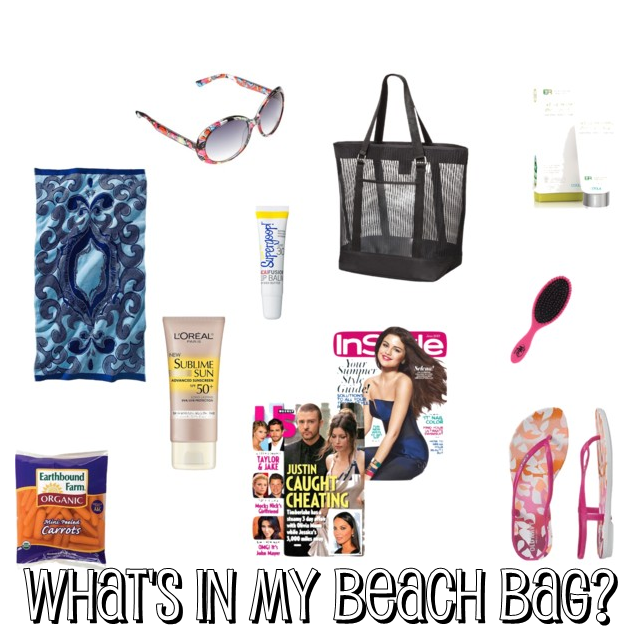 Do you have any of the same items in your beach bag? Check out these the Top Ten Lists of my friends below. I hope to find some killer ideas myself!